Yew has a special place amongst bow-timbers. The great longbows of Henry VIII were made from this magical timber, and many bow-makers today still make fine bows from this very heartwood of English history. What makes Yew-wood so special for longbow-making? The secret lies in its ability to resist forces in both tension and compression. When working with felling trees and timber production, tension and compression are important structural factors. With self-bows i.e. 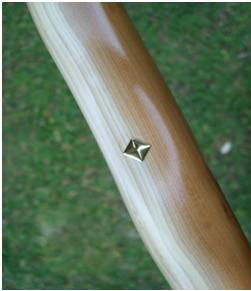 bows which are made from a single piece or “stave” of wood, yew is unique in as much as the pale honey-coloured sapwood resists tension, whilst the amber coloured heartwood resists compression. A longbow is comprised of two parts…the flattened “back” of the bow, which faces away from the archer on the outside bend, forms the strong elastic spine of the bow, and the “belly” which is usually rounded and faces inwards toward the archer, acts as the muscles of the bow, storing energy ready to propel an arrow considerable distances. The inner belly of the bow is where the strength is stored and acts as the powerhouse of the bow. When the bow is drawn, both these factors come into play and make a single stave of yew into a long wooden spring, which then stores and releases huge amounts of energy, and is more than capable of shooting an arrow more than 260yds, and can punch an arrowhead through sheet metal at close range. 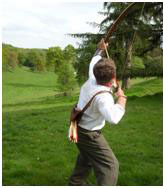 The later Victorian or “stacked handle” longbows were usually stiffer in the handle, with only the limbs flexing at draw, whereas a Medieval or Tudor style bow bends in a smooth arc throughout its entire length. This shape is referred to as bending full compass. Historically, fine self yew staves were at such a premium, they were levied as an import-tax on goods coming into England during the late Medieval and Tudor periods. For every barrel of wine shipped to England from the Continent, a number of yew staves had to be included, so great was the need for fine-grained yew for bow making. Close-up of an English yew longbow made by John Marshall of Sheffield, showing the distinctive two-toned colour of the sapwood and heartwood. Practice with the longbow was enforced by law in England, as English kings made shooting with the longbow compulsory for men of fighting age. These men were largely drawn from agricultural backgrounds, where physical strength and a sound technique were needed to draw and loose the heaviest bows. These various laws produced a breed of men who were extremely accurate in shooting heavy longbows, as proved at the Battle of Agincourt on the 25th October 1415, when the army of Henry V stood against and defeated a massive French force which vastly outnumbered the English ranks. The initial cavalry charge of the French was cut to pieces by a blizzard of English arrows before it got anywhere near the English ranks. Of course, the presence of archers on the field wasn’t the be-all-and-end-all in determining the outcome of that battle, but the longbow’s effectiveness in causing mass confusion and demoralising the opposition certainly helped win the day for the English ranks. Later on in history, when the Medieval period ended and the Tudor dynasty began (the turning point being Bosworth Field in 1485), Henry VII’s son, who later became King Henry VIII was an active promoter of using the longbow and during his reign, commanded that 30,000 yew longbows were to be made and stored in the Tower of London. Henry ordered 30,000 yew staves from the Doge of Venice, as timber from the continent was considered supreme, owing to the growing conditions, and became important when stocks of English yew became depleted. English yew was used for longbows, but after stocks of it began to dry up, yew from continental Europe had to be sourced. Favoured areas such as Spain and Italy were exploited because of their stocks of suitable yew, however most of continental Europe was involved with supplying yew bow-staves for longbow production. 2009 in particular has been a special year for discussing the reign of Henry VIII, as it saw the 500th Anniversary of his accession to the throne in 1509. Much of our knowledge of Tudor longbows came from when Henry’s warship, the HMS Mary Rose was raised from the murky waters of the Solent in 1982, after she heeled-over and sank during an engagement with the French fleet in 1545. When divers explored the wreck-site, they found a number of longbows and chests of arrows contained within the ship. After careful cleaning and preparation, it was found that some of these bows had huge draw-weights and were made to shoot heavy arrows. This incredibly valuable find, has been the defining moment in English archery and indeed towards understanding the importance of the yew longbow in history, and remains the closest thing we have to the great bows of the earlier Hundred Years War. These heavy bows are sometimes known as either Livery or Artillery Bows, due to their heavier draw-weight. The Mary Rose remains a highly regarded source of education towards understanding the physics of Tudor archery. Yew is an incredibly tough, springy wood and is probably the oldest living thing on the planet, with some examples being over 3,000 years old and still alive. Yew is also poisonous as well. The female trees have red fleshy berries and poisonous seeds, whereas the male trees have small cones. The red berries are actually edible, but not the inner seeds, as they contain a toxic alkaloid which causes intense pain if eaten. Although the yew is poisonous, the dried leaves are used in cancer research, which is where the licensed drug “Taxol” is obtained. English, Common or European yew (Taxus baccata) is commonly used for longbow making by craftsmen today, with excellent results. Another species of yew, the Western Pacific or Oregon yew (Taxus brevifolia), is a tight grained wood, and lends itself perfectly to producing fine bows. The practice of making and shooting the yew longbow has stayed with us since ancient times. One form of shooting which is popular, is the practice of “shooting at the marks” which is known as “roving”. This was popular in both Medieval and Tudor times, and involves cross-country shooting from one mark or flag to the next. Distances can be varied, with shorter shots over uneven ground, or very long distance shots over open country. Another variation is “flight shooting” which is simply shooting for distance. Nowadays, most people shoot with either self longbows or laminated longbows. A laminated bow is one which is made from two or more different types of wood, which are glued together. These bows are usually very high performance and produce weapons which are very powerful and can achieve huge distances. Yew wood will always hold that special place as perhaps the most mysterious and ancient of timbers, and thankfully many people still keep that spirit alive by shooting these weapons which helped shape the path of history. As the saying goes “a post of yew will outlast a post of iron”. Gavin Banks, January 2010.